De Cocktail Audio X10 is een zeer uitgebreide audio speler met kleuren display en CD speler waarmee eenvoudig CD’s naar MP3, Flac, Ogg of WAV geript kunnen worden naar de optionele interne harddisk. Hiermee wordt het digitaliseren van je muziekcollectie dus een fluitje van een cent. Daarnaast kan de X10 internet radio afspelen en muziek vanaf een NAS streamen en is eenvoudig te bedienen met het 3,5″ kleurendisplay. De Cocktail Audio X10 is nu te bestellen in onze webshop. 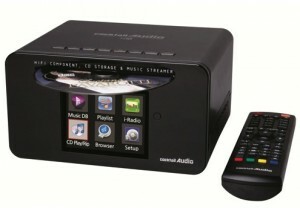 Revolutionary HD HiFi Audio System, CD storage, Music Streamer, Music Server and Advanced Internet Radio. X10 is a revolutionary HiFi Component. X10 has a high speed front loading CD drive built in with 3.5″ full color TFT LCD to display well designed high quality UI(user interface). Also, X10 uses 3.5inch SATA hard disk as storage to load all your CD collection. Think about 1 Terabytes or 2 Terabytes hard disk. It’s big capacity enough to load all your CD collection. X10 has an high quality 60W amplifier inside which can deliver wonderful sound through your existing HiFi system or your own loudspeakers. Of course, X10 provides a nice bookshelf speaker as option. Now, let’s see in detail what kind of interesting functions it has. X10 is not big. It’s cute and small enough for your living room. The size is 18Cm(width) x 14.7Cm(depth) x 9.8Cm(height). It fits quite well beside or on your home theater system. Of course, any small space under the TV will be OK for it. Its simple design and high quality finishing will make your living room more comfortable. How many audio CDs do you have? You have 500 CDs, 1000CDs, 5000CDs or 10000 CDs? That huge CDs will surely make your living room look cluttered. Just load all your CDs to X10, and then keep them in the place like attic or garage away from your precious living room. Now, you can scroll all your precious music stored in X10 with remote controller from the sofa. You can rediscover your many beautiful music which had been sleeping in the CD shelf for long time. Encoding Option: X10 provides four options (MP3, FLAC, OGG or WAV) for encoding. Do you want to enjoy original CD level quality sound? Then, choose WAV option for encoding. Do you want to save the space of X10 hard disk? And, do you want to transfer your CD to your MP3 player for travelling. Then, choose MP3 option. Making CD database: This is the process to make CD database. Once you input CD information like title, artist, album, year and genre, it will be your CD database by which you can search any music easily. CD information will be entered automatically by FreeDB if X10 is connected to network(internet), or FreeDB data is installed in the hard disk of X10. Otherwise, you can also input CD information by manual with your exiting USB keyboard or the remote controller bundled with X10. Now, your X10 holds your entire CD collection on the hard disk of it. It will give you instant access to any of your music. With the remote controller of the X10, you can search any music easily by title, artist, album, year or genre that you entered when you load your CDs to X10. Pressing the assigned key of the remote controller and typing a few alphabets make you see the list you want through the 3.5” full color screen in the front of X10. You can search any music by title, artist, album, year or genre. Just enter a few alphabets, then some list will be displayed on the screen. Select the music that you want, and press OK button. Playing screen. Your old collection of LP or cassettes ! Don’t keep them sleeping any more in the attic. Do you have LPs or cassette tapes? Don’t keep your precious and wonderful music in LP or cassette tapes sleeping any more in the attic. Just record them into X10. Once you record them into the hard disk of X10, I am sure you will try enjoying them more frequently because it is far more convienent to have an access to them than before. Just scrolling and pressing a few buttons of the remote controller in your sofa will deliver wonderful music to you. You feel just like that an old friend moved to your neighborhood from far. What an interesting world ! Have you ever listened to a radio broadcasting from other countries? Try it and you will have a big fun. X10 has famous internet radio stations. The stations are classified by genre and country. Also, you can put your favorite stations into the My favorites folder for your convenience. And you can record iRadio broadcasting into the X10 with ease. What can you do with USB host port of X10 ? Nowadays, USB hand-held devices like memory stick and MP3P are very popular. I think they are essential devices for our life. X10 works well with these devices. If there is a nice dance music in your USB memory stick, just plug it into the USB host port of X10, then you can enjoy the dance music at a level loud enough for dancing and playing the air guitar. During travelling, some music give you more fun. When you should leave your home for travelling, just plug your MP3P into the X10 and copy your favorite music from X10 to your MP3P. X10 uses 3.5 inch SATA hard disk for its storage. X10 was tested and verified with up to 2 Tera Bytes 3.5inch SATA hard disk. Currently 2TB is the biggest 3.5″ hard disk available in the market. To support bigger capacity hard disk, the firmware of X10 will be updated later.